Maude was the venue for the 2017 Club Road Championships. A late change in course to avoid the overly aggressive wild life this time of year saw rider’s complete laps of the tough Maude/ Steiglitz/ She Oaks loop. Small but quality fields in all grades hit the start line and despite the testing hills bunches remained largely together. 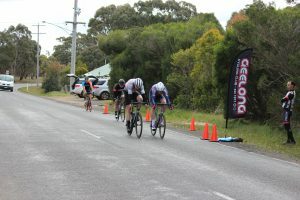 A grade & for the title of club road champion was raced over 4 laps and despite a solid tempo no rider was able to make a decisive break or split. The quality of the riders and evenness of their abilities ensued that the races was going to come down to a bunch kick. Coming around the final bend to the line, there was no real favourite. Current club champion, Nick Squillari hit out first and looked to have it won, but in the last moments Trent Clifford appeared and in a desperate through to the line took the win by 0.018 of a second. Passed club champion Tom Paton taking 3rd less than a second back with Matt McDonough in the mix in 4th place. A wonderful finish to the race. The 3 lap 60K C/D grade race took a similar path to the championship race with the bunch largely staying together for the entire race. There were some attacks with a few riders happy to push the envelope and try their luck, but no one was allowed to escape. Again it was destined to be a bunch finish with Nick Lanham taking a tight win from Paul Rettke & Steve Douglas. Mark Woodhead taking the win in the D grade race. Well done to Trent Clifford on winning the title of 2017 Club Road Champion. In the U19 race of the up & coming talent over 60K Dom Van Slageren proved too strong for the rest. Breaking with Lincoln Clark at half way before putting the hammer down up one of the climbs for a solo victory. Lincoln riding well to finish second ahead of Ryan Baker. In the women’s race Danni Bridger won the won’s event & daughter Molly taking out the U19. Well done to all the other junior riders who took part on the tough course around Maude. Full race results; https://results.sporthive.com/events/PC1455799/races/4596806 Be sure to use the filter to see results by event. Pictured; Nick (2nd Place), Road Champion Trent Clifford, Tom (3rd) & top 3 with all other winners on the day.